1. 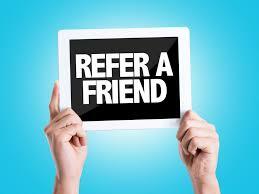 Sponsor 5 Basic members in one month and get #1,000 worth of airtime. 2. Sponsor 10 Basic members in one month and get #2,000 worth of airtime. 3. Sponsor 10 platinum members in one month and get a quality Android Phone. 4. 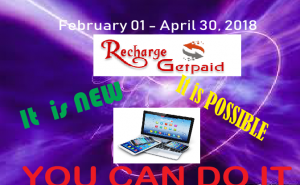 Accumulate 5,000PV in one month and get a tablet Phone. 5. Accumulate 10,000PV in one month and get a Laptop. 6. Join from February and qualify for the international trip Award latest by 30th April, and get a Laptop. 7. As an existing (old) RAGP member, accumulate (produce) fresh 20,000PV between 1st February and 30th of April and qualify for a laptop +Phone. NOTE: * Existing members hoping to achieve any of the above prizes should Screenshot and save their cumulative PVs as at 1st February, 2018. *The 40% Rule for awards qualification applies to these promo award. * RAGP Reserves the right of the interpretation of the terms and conditions for qualification for the promo prizes. MAINTENANCE ON GOING-The Recharge and Get Paid Website is Undergoing Maintenance.